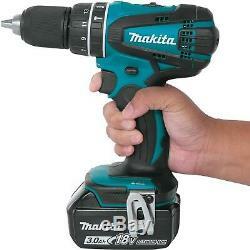 Makita XPH01 / bhp456 18V Lithium-Ion Cordless 1/2-Inch Hammer Driver-Drill. Body + 4.0 AH battery. Makita-built 4-pole motor delivers 480 in. Variable 2-speed design (0-400 & 0-1,500 RPM) covers a wide range of drilling, driving and hammer applications. Compact design at only 8-1/8 long and weighs only 4 lbs. Light with afterglow illuminates the work area. New redesigned rubberized soft grip provides increased comfort on the job. All metal gear construction provides increased durability. Life by actively controlling current, voltage and temperature. Makita-built 4-pole motor delivers 480 inlbs of Max Torque. Compact design at only 8-1/8-Inch long and weighs only 40 lbs for reduced operator fatigue. Please ignore picture where shows 3.0AH batyery it will comes with 4.0 Battery. The item "Makita XPH01 / bhp456 18V Lithium-Ion 1/2-Inch Hammer Driver-Drill +battery 4.0" is in sale since Monday, January 21, 2019. This item is in the category "Business, Office & Industrial\Power Tools\Drills\Drills\Cordless Drills". The seller is "aras2x" and is located in Romford.